Solo 421-S Portable Spreader is an alternative to a wheeled spreader allowing you to spread granules in areas where wheels will not go. Equipped with a comfortable padded strap that goes across the shoulder, an adjustable 240 degree spread radius (to keep granules from coming back on the operator), and controls for volume and direction at your fingertips the Solo 421-S Portable Spreader is made with the operator in mind. Constructed of rustproof poly the spreader is easy to clean and durable. With a gear box that is completely enclosed and has lubricated metal gears the Solo 421-S Portable Spreader is made for a long useful life. The agitator in the spreader helps granules to fall evenly onto the impeller to insure a uniform spread and to prevent blockages. Whether full or empty the hopper always stands upright. Fully enclosed gear box with lubricated metal gears assure long life and durability. Padded strap with comfortable, cross-shoulder design. 6 in. opening with screw-on cap. Hopper stands upright whether empty or full. A few of the possible uses include spreading: Ice melters; Oil absorbers; Seed; Bird seed; Sand, Salt, etc. ; Cleaning agents; Fertilizers; Feed stock; Pelletized lime; Wild game feed. Extremely well made German product, takes 5 minutes to assemble and to understand how to adjust. The build quality is evident in the smooth operation of the gears when you turn the handle. My wife used a Scott's hand-held spreader while I used this nuclear weapon and she was jealous! We were spreading Snapshot for weed control. Saves a lot of time. The directions that came with spreader were very lacking in what no. to set for spreading the Talstar PL Product... Kind of trial and error... but when the cost of the product is this much it makes the test settings somewhat costly.. Not sure I would purchase again.. to spread the product I bought.. Using my small hand held grass seed spreader is much easier.. I've used this for fire ant bait, fertilizer and clover seed, and it even worked for oats. It worked well each time, and it was easy to clean. The little side flap could be put in the bell/whistle category, but I ain't griping. This spreader is a bit pricey, but it is worth the money. Very well designed and works smoothly. Easy to operate and clean. However, the part that is a bit troublesome is finding out where to set the hopper discharge. The product I bought did not reference the Solo. I called Do My Own Pest Control, Solo, and the company that made the product I was spreading. No one could offer a setting. All three said I would have to just experiment. Honestly, I don't know if I spread too much product (insecticide) or too little. Had it not been for this issue I would have rated it 5 Stars. Spreader worked perfectly right out of the box. Some assembly required (handle). Put down 280 pounds of product, without a problem. Delivery of product, right on time. Used the next day. How much product can the Solo 421-S Portable Spreader hold? How many pounds of Talstar or other similar granules can fit in the reservoir of this spreader? 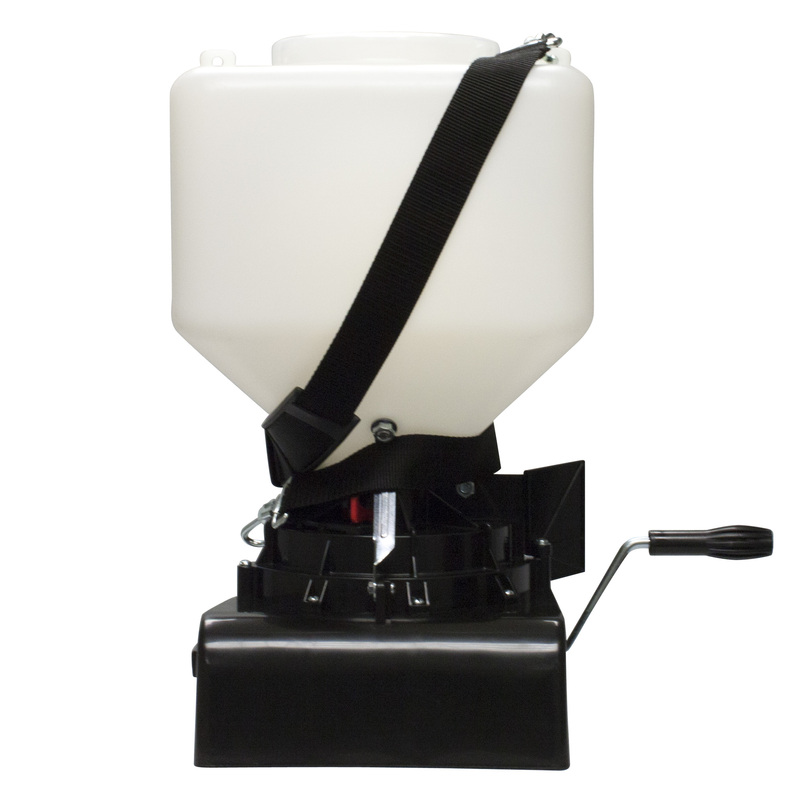 Per the manufacturer the Solo 421-S Portable Spreader has a load capacity of 20 lbs. What settings do I use for the Solo 421-S Portable Spreader to apply Talstar Xtra? Solo 421-S Portable Spreader settings may vary depending on how fast you walk. If you need to use 3.6lbs of product per 1,000 sq ft you would add 3.6 lb of product to spreader, start with a medium setting, then apply product to a 20 x 50 ft area (1,000 sq ft). If you have product left, your setting is too low. If you run out of product, your setting is too high. Can the Solo 421-S Portable Spreader be used if a smaller radius spread is needed? Yes the Solo 421-S Portable Spreader can be set to a smaller radius, per the manufacturer. You would need to look at the user manual of the product in the picture D. The lever that is above the white disc in that picture will adjust the direction of the granular flow. Either right, left, or center. You would use this along with the reflector shield to guide the granules you are using to the smaller radius that you would like. 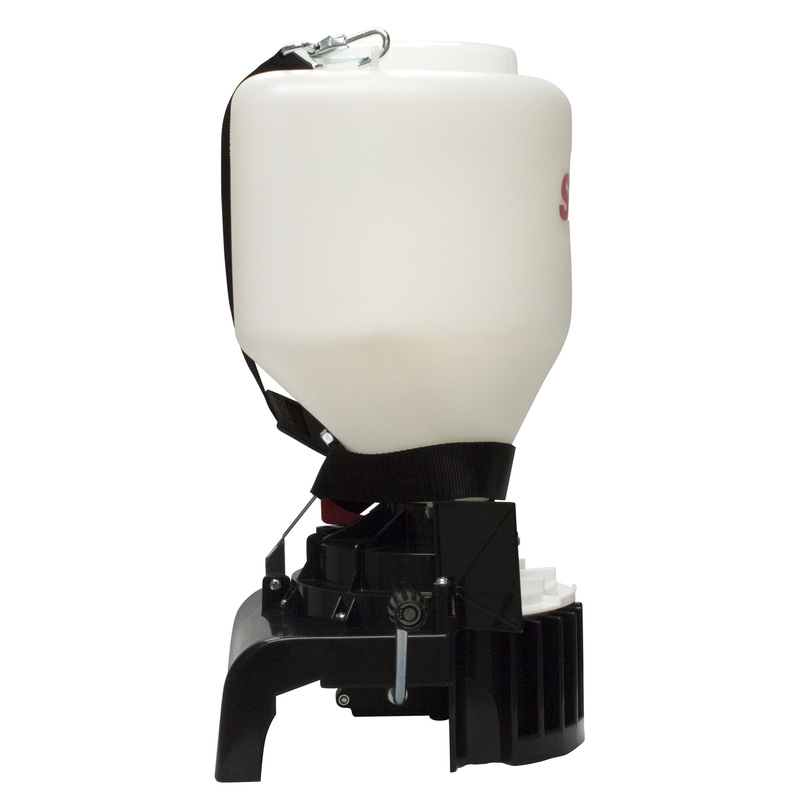 Will the Solo 421-S Portable Spreader work for fire ant baits requiring very low flow rates (Amdro or Extinguish) evenly? 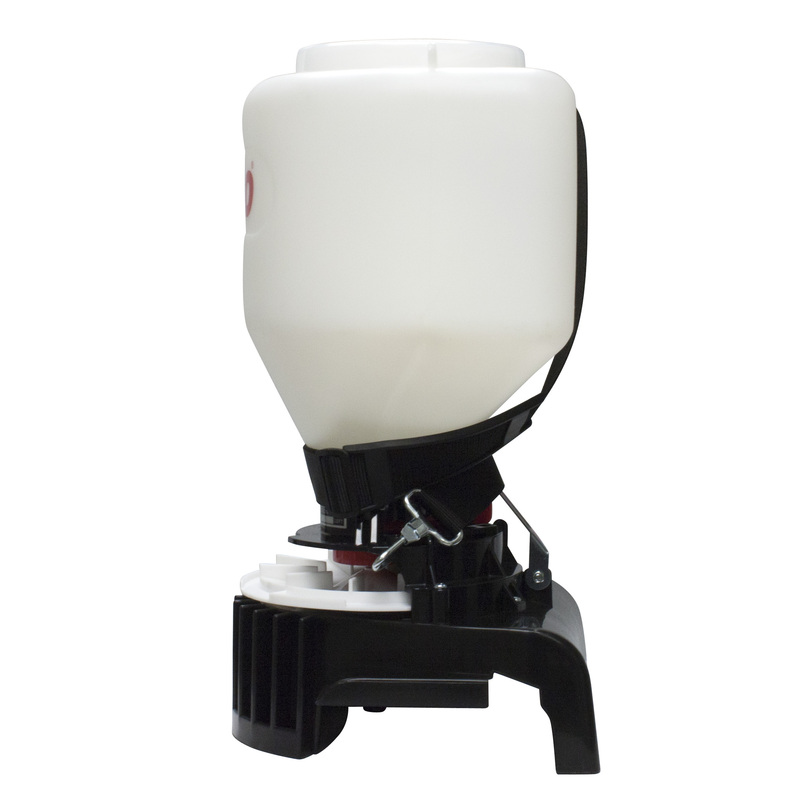 The Solo 421-S Portable Spreader can be used with Amdro or Extinguish, however, this spreader will hold up to 20 lbs of bait. It is mainly used for larger jobs but can be set to cover a smaller radius if needed. You would need to look at the user manual of the product in the picture D. The lever that is above the white disc in that picture will adjust the direction of the granular flow. Either right, left, or center. You would use this along with the reflector shield to guide the granules you are using to the smaller radius that you would like. 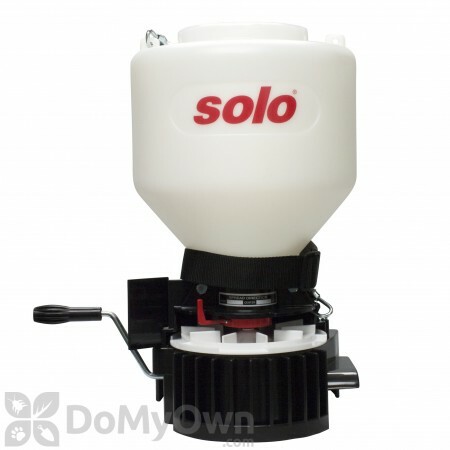 Can the Solo 421-S be adjusted to evenly distribute small amounts of ant bait? Many ant baits only require 1 to 1.5 pounds per acre. They clog easily. I have problems finding a spreader that will drop only a small amount of ant bait. I usually end up putting much more than is required which is very costly. If not this spreads could you recommend another? While the Solo 421-S Portable Spreader can hold up to 20 lbs, you could use it to apply baits such as fire ant bait. We recommend using the lowest setting on the spreader and still applying very sparingly. Per the spreader manual, pelletized fertilizer (maybe a little large than that granule bait) is usually thrown about 10-12 feet in front of the operator and about 5-7 feet on each side at 55-60 rpm. We always recommend calibrating your spreader over a small area of 1000 sq ft before treating the entire lawn so that you can adjust as needed.